Named as BusinessWeek's #1 Management Educator, expert Dave Ulrich and his team of authors bring human resources a whole new way of thinking and practicing - moving the focus from internal issues to actively helping to set business strategies. Businesses of the future need "all hands on deck" when implementing new ways to stimulate grown and cost efficiency, and this includes human resources. This team presents a four-phase model of transformation that shows you step-by-step how to make meaningful progress in contributing to the performance of your company by redesigning HR to work as a strategic partnership. David Ulrich is co-founder of the RBL Group and professor of business at the University of Michigan's Ross School of Business. He's ranked number one as a management educator guru by Business Week. Hewas selected by Fast Company as one of the ten most innovative and creative leaders. He has been named the most influential person in the HR field by the U.K. HR magazine four out of the last five years and was most recently listed number 31 on the Thinker's 50 global ranking of business gurus. 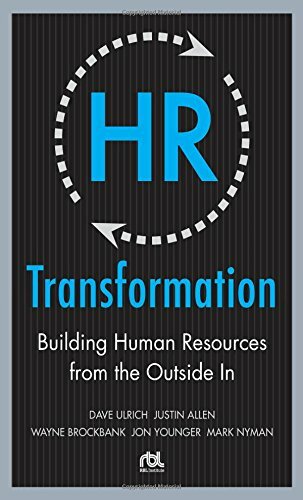 He's written 20 books covering topics in HR and leadership, including The Leadership Code and HR Transformation.